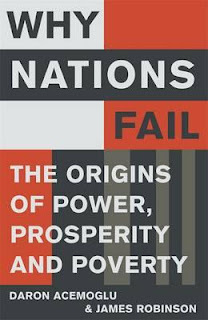 My Father in Law, Dr. George Lambrakis a career US diplomat who worked in Guinea Bissau, Lebanon, Vietnam, Laos, Swaziland and Iran amongst other places, has been telling me how much he enjoyed reading the Acemoglu and Robinson book Why Nations Fail. So I asked him to do a review for this blog, which he kindly did. Here it is. It is interesting to get a diplomat's view of a development story. Enjoy. Forget about modernization breeding democracy from successful economics. Forget about authoritarian regimes moving faster than democracies toward sustainable development. Forget about the “ignorance theory” that you just need to teach effective development to leaders of less developed (not “developing”) countries. Forget even geopolitical or cultural theories that seek to explain success or failure. Think, rather, of the need for “inclusive” political institutions to exist or develop if innovative economic institutions are to emerge and not be strangled at birth by “extractive” elites. Inclusive political institutions permit and reinforce inclusive economic ones if not blocked by extractive institutions created by kings, emperors, dictators, aristocrats and other agents of political exclusion or repression. These by their very nature react against and try to smother the sustainable economic development that requires Schumpeter's “creative destruction” - since innovations necessarily disrupt comfortable monopolies and other institutions controlled by the ruling elites. This is not to say that economic development does not frequently make some progress under extractive rulers. It just runs out of steam, as the authors indicate through innumerable – and impressively researched – examples from all parts of the world (with emphasis on Latin America and Africa) and through millenia of history. The Soviet Union or Communist China can achieve much catch-up growth utilizing other peoples' economic innovations, but they eventually run into a blank wall by resisting the creative destruction that will hurt the leadership's selfish interests – unless they are forced one way or the other to reform. Inclusive institutions grow from largely contingent small differences like Britain's 1688 “Glorious Revolution” among national societies (e.g. the British or Dutch as opposed to most others) that take advantage of great “historical turning points” (economic disruptions) such as the medieval Black Death, the opening of Atlantic trade, or the Industrial Revolution. There is no recipe for building inclusive institutions. But history indicates (p.460) the need for 1) “a degree of centralized order” to prevent chaos, 2) “preexisting political institutions that introduce a modicum of pluralism” and 3) the “presence of civil society institutions that can coordinate the demands of the population” - especially empowered media. Today's Brazil and Botswana are good examples. Fujimori's Peru and a variety of chaotic or dictatorial countries in Africa and places such as Afghanistan and others in Asia are bad examples. Explaining how history operates is what this book is about. It does not really concern itself with how creative destruction can in the short term hurt the unemployed poor, before improving their lot in the long term. However, the authors do take a crack at foreign aid in the final part of their summarizing chapter. Aid agencies do not pay enough attention to the countervailing power of extractive elites in the countries whose poor they are trying to help. Conditional aid sounds good – but recipient governments get the same aid even if they do not meet the conditions, because their people are so poor. Unfortunately, such wastage is compounded by the plethora of agencies and middlemen who also take their cuts for overhead along the way, leaving only 10 to 20 per cent of donations for the poor – though even that is better than nothing, especially if targeted, as for schools. For me, Acemoglu-Robinson's argument is a convincing one as far as interpreting history goes. The issue becomes how to apply it in practice. For example, there is little doubt that much if not most of the world's progress has taken place under extractive governments who, using this book's terminology, were playing catch-up following innovations produced by others – or perhaps themselves at an earlier time – who enjoyed inclusive institutions. The authors themselves support this interpretation when they refer to the “iron law of hierarchy” by which groups overthrowing one extractive regime often seize its institutions to profit themselves from their extractions – as many post-colonial regimes did in Latin America, Africa, the Middle East, and Asia. So how do those who wish to help the poor avoid simply filling the coffers of extractive elites? The authors warn against trusting common theories of development. But they cannot suggest a viable alternative apart from looking for countries that have somehow obtained the prerequisites for inclusiveness through accidental “contingencies” of history. Perhaps in a follow-up study the authors might try to fathom how the favorable contingencies in, say, Britain's history might be reproduced in other countries suffering under extractive regimes today. They make a promising start on this quest when they analyze how Botswana's relative poverty protected it from colonial or other extractive invaders and how “Lula's” rise transformed politics in Brazil." I avidly follow alot of aspects of growth and decline in quite a few parts of the world and cost and ease for accsess to the internet is now on the forfront for anyone worldwidead in developing world its the availability of a friend of a friend who has it can be as useful as personal accsess as poor people tend to be genorous with knowledge inquiry ! !